In The Founder's Constitution, an anthology of writings (letters, records of debates and early cases) relating to the Federal Constitution, Justice Jonas Platt’s New York Court of Errors opinion in Gibbons v. Ogden (17 Johns. 488 ) and Chief Justice Marshall’s opinion in Gibbons v. Ogden (9 Wheat. 1 ) are included as Document 14 and Document 16, respectively, of the materials underlying Article 1, Section 8, Clause 3 (Commerce). 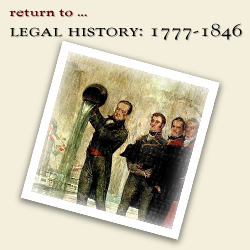 Following the 1812 decision of the New York Court of Errors in Livingston v. Van Ingen, Livingston & Fulton continued to enforce their steamboat monopoly in New York. But State monopolies were unpopular nationwide because they impeded the free market economy and, between 1819-1820, several cases challenging the New York steamboat monopoly were litigated in the New York Court of Chancery. The most famous of these involved the Revolutionary War hero Aaron Ogden who sought an injunction restraining his erstwhile partner, Thomas Gibbons, from operating a ferry in competition with Ogden’s. 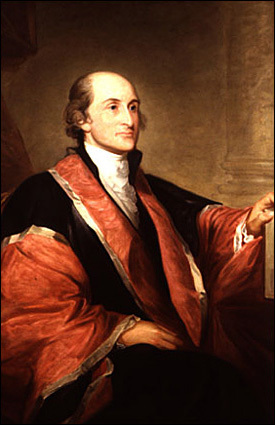 This dispute eventually reached the Supreme Court of the United States, and in a landmark decision, Chief Justice Marshall addressed the scope of Congress's authority under the Commerce Clause. The first of these case came before the New York courts in Livingston v. Ogden and Gibbons, 4 Johnson Ch. 48 (1819) where monopoly owners Livingston & Fulton sought an injunction against Ogden and Gibbons, the operators of a steamboat service between New York City and several ports in New Jersey. Utilizing synchronized schedules, Aaron Ogden ran a ferry service between New York City and Elizabethtown Point, NJ, and Thomas Gibbons ran a service between Elizabethtown Pointe and several other ports in New Jersey. Ogden held a license from the Livingston & Fulton monopoly but Gibbons, who operated in New Jersey, did not. Chancellor James Kent denied the injunction against Ogden on the ground that he was operating within the terms of a monopoly license, but granted the injunction against Gibbons, enjoining him from navigating the waters of the New York bay or on the Hudson river between Staten Island and Powles Hook. Following Kent’s decision, Ogden and Gibbons became entangled in a dispute unrelated to the case, and Gibbons obtained a license under the Federal Coasting Act of 1793. He started a ferry service in direct competition with Ogden. In 1818, Ogden sought an injunction in the New York Court of Chancery restraining Gibbons from operating steamboats in the waters covered by Ogden’s monopoly license (Ogden v. Gibbons, 4 Johns. ch.176 ). Chancellor Kent held that the purpose of the 1793 Federal law was to exempt American vessels from the higher fees paid by foreign vessels, and that it did not invalidate the Livingston & Fulton monopoly. Relying on the decision of the Court of Errors in Livingston v. Van Ingen, the Chancellor granted a permanent injunction enjoining Gibbons from operating a ferry in New York waters. Gibbons appealed to the New York Court of Errors and Justice Jonas Platt, apparently anticipating that the case would be appealed to the United States Supreme Court, wrote a detailed opinion affirming Chancellor Kent’s decision (17 Johns. 488 ). As expected, Gibbons took an appeal from the New York Court of Errors to the Supreme Court of the United States. He was represented by Daniel Webster and William Wirt. Ogden was represented by Thomas Addis Emmet and Thomas J. Oakley. Webster argued that Congress had exclusive power over interstate commerce under Article I, Section 8 of the Federal Constitution while Ogden’s counsel asserted that the Congress’s power under the Commerce Clause applied to the transportation and sale of goods and not to navigation. The Supreme Court, in an opinion written by Chief Justice Marshall, held that the power to regulate interstate commerce was granted to Congress by the Commerce Clause. Because New York's steamboat monopoly was inconsistent with the Federal law regulating coastal trade, the New York licensing requirement was invalid under the Supremacy Clause of the United States Constitution.